The Terrifics Annual #1 Review – AiPT! Welcome to an all star creative special annual of The Terrifics! Every story is as great as the one before. There are three distinct stories within this annual so I’ll split my review into three separate parts, one for each story. The first story is by Gene Luan Yang with art by Joe Bennett and is about a mishap at the Stagg Labs during a Halloween party for interns that causes Plastic Man-based monsters to go wild. Yang, as usual, writes a story that is a pleasure to read and Joe Bennett’s style (which makes Plastic Man look frightening) works incredibly well in the context of the issue. The second story is by Mark Russell with art by Evan ‘Doc’ Shaner and is about Java the Caveman, the right hand to Simon Stagg. As with the first story DC has put a fantastic writer and artist combination on this one as well, with Russell bringing his flair to a story that is at its core about the death of the Neanderthals due to the appearance of homosapiens on the Earth and how it affected Java, a neanderthal surrounded by the very race that wiped out his own. The third and final story is by James Asmus with art by Jose Luis and is a prequel to the first issue of The Terrifics, showing how Tom Strong’s message arrived there. This was the story I wasn’t as sure about before I read it as I have very limited exposure to Asmus as a writer and Jose Luis as an artist — I’m not too familiar with Asmus besides his work on the last Terrifics issue. Overall this entire annual is something I very much enjoyed and everyone involved brought their A game to deliver fantastic content to everyone. It’s three startling Terrifics tales, kicking off with a deadly nightmare at Stagg Manor! 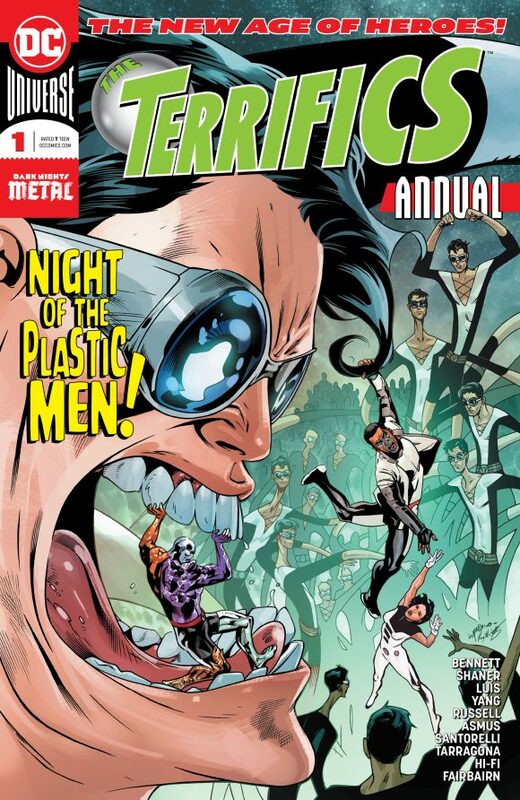 When a plot to steal Plastic Man’s powers goes awry, the Terrifics’ new home and everyone in it are at the mercy of stealthy plastic monsters. Looks like Sapphire picked the wrong day to host a Halloween dance for her Stagg Industries internship program! Next up, discover the secret origin of Java the caveman, and the secret he’s keeping will shock you. Last but not least, we uncover Tom Strong’s hidden adventure in the Dark Multiverse–hold on to your holy socks! Let’s start with Yang and Bennett’s story. Bennett’s artwork does wonders to this thanks to his horror roots (brilliantly shown in The Immortal Hulk) and how he makes the Plastic Men look like creepy creatures out of nightmares that you’d expect to see in a Del Toro movie. Plastic Man and Metamorpho especially look like they would fit in a monster horror movie brilliantly, mostly due to how Bennett’s style portrays their shape-shifting, oftentimes making them appear as monstrous looking creations. Yang’s writing of the story blends a set of fun character interactions along with the creepy horror aspect of the main plot. One of my favourite parts of the story was how Mister Terrific would repeat math equations in his head whenever he was feeling nervous, spoiler – it’s a lot, and that some of the other team members would make jokes about it. Now onto Russell and Shaner’s story. As always Doc Shaner’s art is absolutely stunning and a beauty to look at. Nathan Fairbairn’s colours do wonders for Shaner’s art and really emphasises his style. Even if all the lettering from speech and narration was removed you’d still be able to grasp a cohesive and understandable story from Shaner’s art alone, in large part thanks to his brilliant pacing and panelling. Shaner’s visual storytelling ability is one to be envied. Russell’s story deals with Java’s days back in the age of Neanderthals. It shows how he and his tribe are slowly driven to desperation and death by the appearance of humans in their first stages and how they could out think and out hunt Java’s people which led them to start starving and led Java to go hunting in the area he got frozen. It’s a fantastic look at how such a similar species was driven to extinction due to evolution and really builds out the backstory for a character that’s been around for many many years. The third and final story is by James Asmus and Jose Luis. Jose Luis’ art is pretty great, as with the previous issue of The Terrifics. The artwork fits the feel of the Dark Multiverse and the creatures Tom Strong encounters within and evokes a great big cosmic feeling to it that I am totally in love with; art I especially loved was the cosmic energy radiating from the Galactus like creature’s chest that Tom defeats and leaves for the Terrifics to find in issue one. James Asmus wasn’t a writer I was particularly aware of before this issue hit and I was wary on how well he’d pull off this story. However any doubts I had about him have completely gone because he captures Tom’s inner thoughts and science nature fantastically in this short eight page story that serves as a prequel to issue #1 of the series. He really brings his A-Game and I would even be really excited if he was to write a Tom Strong series in the future. Every story within this annual is fantastic with none I could call a clear winner. Every creative involved brings their A game and it is a fantastic issue for that. ... That is enhanced by the artists who all bring their best to the issue and fit fantastically.. ..But are propelled even more by the fantastic team of inkers and colourists that they have for the issue. None of the stories feel like they were unneeded, instead they all feel unique and fit in perfectly.